← Stoke City in Europe! England vs. The World! Absolute vs. Relative Space?! Bin Hammam to oust Sepp Blatter as FIFA President? Let’s hope so. It has been officially announced that the FIFA presidential election will be contested between Mohamed Bin Hammam and Sepp Blatter, the current head of the organisation. 75-year-old Blatter is hoping to be re-elected for an astonishing fourth four-year term but is facing his first contested election since 2002. So, what sort of threat does the 61-year-old Qatari, Hammam, pose? At first, it was expected that Blatter’s re-election would be a formality. Today, the betting odds on Blatter winning the upcoming FIFA presidential election currently stand at 1/2, while Hammam is the slight outsider at 6/4. As the betting odds suggest, there is a distinct possibility that the Swiss supremo’s reign could end with the June 1st election. If that was the case, many people in the footballing world would breathe a long-awaited sigh of relief. The controversial character has floundered for far too long as the most powerful man in football. Hammam’s credentials will be discussed shortly, but first, let’s examine the case against Blatter. His very first election campaign, way back in 1998, was marred with the sort of controversy over finances that has plagued his reign ever since. Farrah Addo, the then president of the Somali Football Federation alleged to have been offered $100,000 to vote for Blatter. Of course, Blatter did not directly approach Addo, but those who were campaigning on his behalf were accused of trying to buy votes. Six years after the bribery scandal, Blatter caused uproar when he called for women footballers to wear shorter shorts and tighter tops, and, in the same year, FIFA (under Blatter’s leadership) infamously ruled that players who removed their shirts after scoring a goal, as well as those guilty of ‘over-zealous celebrations’ were to receive yellow cards. Not only has Blatter been involved in questionable rule changes to the game; he is prone to saying the wrong thing at the wrong time. Recently, after the awarding of the 2022 games to Qatar, the illegality of homosexuality in the nation caused him to joke: “I would say they [gay fans] should refrain from any sexual activities.” Gay rights groups, and football supporters in general, condemned his view. And, to top it all off, the ridiculous silver goal rule was Blatter’s idea. Thankfully, he saw sense (for a change) and the rule has since been scrapped. To his credit, Blatter is recognised with boosting football’s profile throughout the globe. The 2010 World Cup in South Africa was the first played on the African continent, and, after FIFA awarded hosting rights for the 2018 tournament to Russia and the 2022 finals to Qatar, the sport’s biggest tournament will be played in Eastern Europe and the Middle East for the first time. 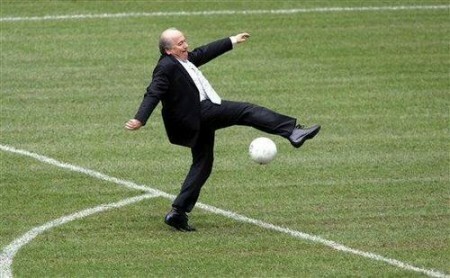 “At FIFA, we will continue to pursue our goal of constantly developing football all over the world,” Blatter said. Perhaps, though, these successes have come about in spite of Blatter, rather than because of him. Until it was confirmed he would run in the FIFA presidential election, Mohamed Bin Hammam was relatively unknown compared to his election rival. Now, though, it would seem the president of the Asian Football Federation is in with a genuine chance of ousting Blatter to become the most influential man in football. Transformation is Hammam’s theme in the build-up to the June 1st election. He has promised to use goal-line technology and to regenerate FIFA, so that the bidding process for future World Cups is more open. If he is elected to the post, Hammam has pledged to introduce two more officials behind the goals, reduce the decision-making burden on FIFA’s central committee and spread its wealth. Hammam is certainly promising a lot – and much of what those in the footballing world have been crying out for for some time. Crucially, though, Sepp Blatter says he will step down as FIFA president in 2015, if he is re-elected for a fourth term. This has been interpreted as a message to UEFA president Michel Platini, who is reported to be keen to take over from Blatter in 2015. Platini is central to the success or failure of both candidates and Blatter’s declaration could just help swing the Frenchman’s support behind the Swiss candidate. So, while Blatter and Hammam have laid their cards on the table, Platini – for now – is keeping his close to his chest. Check back tomorrow for a look at the Liverpool vs Arsenal game from Sunday, and don’t forget to follow @gdfeet4abigman on Twitter. This entry was posted in Football and tagged bin hammam, Election, FIFA, Michel Platini, Sepp Blatter. Bookmark the permalink. 3 Responses to Bin Hammam to oust Sepp Blatter as FIFA President? Let’s hope so. Hmmm… I’m not at all convinced. ‘Any other candidate’ doesn’t seem like reasonable grounds to oust Blatter, the devil you know and all that. And aren’t all prospective candidates going to promise the earth? I think in the 13 years of his presidency Blatter has done alright, and I am with him on the technology issue. I also think Mr Murdoch would challenge the view that the FIFA president is the most influential man in football…..
Blatter’s time is up. The guy is a laughing stock. Although the policies of the two candidates are reasonably similar, Bin Hammam is the only candidate who represents a fresh for FIFA. He is a popular president of the Asian Football Federation and – if he wins on June 1st – might actually bring respect to the organisation (Blatter seems to have had the opposite effect). Surely the FIFA president – who can change the rules of the world’s most popular sport, reward and discipline teams and players, and so on – is more influential than the guy whose media company decides when to screen matches? Although the policies of the two candidates are reasonably similar, Bin Hammam is the only candidate who represents a fresh start for FIFA. He is a popular president of the Asian Football Federation and – if he wins on June 1st – might actually bring respect to the organisation (Blatter seems to have had the opposite effect).